All too often, my dad calls my attention to the TV or computer screen to view something he thinks has educational value. He forgets that some dogs (me, for example) possess intrinsic wisdom and awareness which renders media sources unnecessary. Nevertheless, he showed me clips from an animated feature he watched in the early sixties involving a dog genius and his child companion. The characters, known as Mr. Peabody and his boy Sherman, traveled back in time via the WABAC machine invented by Mr. Peabody. Once they arrived at a historic location, they found events were skewed due to Mr. Peabody’s having manipulated the machine’s programming. This provided Mr. Peabody the opportunity to make things right and to subject Sherman to some of the most painful puns ever recorded. Brilliant!! I was transfixed. Not only did the premise seem vaguely familiar – incredibly intelligent dog bearing a strange resemblance to me, hanging out with a kid who was somewhat less than astute – but it indulged the fantasies of many dogs to bash humans over the head with life lessons, one of which is to lighten up..life is too crazy to be taken too seriously. I was excited. So, I immediately took a nap (hey..priorities). I dreamed that I had invented a modern-day WABAC machine, and I took Dad back to the Roman Colosseum. The Detroit Lions were going up against Tim Tebow and company. Sold out stadium. The concession stands were selling Ceasar’s Pizza. Roman Polanski was producing the half-time show. Autumn was in the air..the fall of Rome. The P.A. system was too loud because Nero was fiddling with the controls. A male lion had just consumed a woman convicted of ‘tagging’ Hadrian’s wall. She looked tasty, so the lion was obviously glad-he-ate-her. Good times. But it was getting late, so I took Dad for a bite at the olive garden before we returned. A famous man (undoubtedly inspired by a dog) once said, “If you will it, it is not a dream.” So I intend to start work on a real WABAC machine as soon as I can develop opposable thumbs. I know the creation of Mr. Peabody and Sherman was credited to Ted Key, but you just know ‘ol Ted had a dog. Do you think the idea for Mr. Peabody may have germinated in the mind of that creative canine? Elementary, my dear boy. 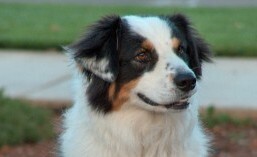 This entry was tagged aussie, australian shepherd, blog, dog, humor, mr. peabody, rocky the squirrel, sherman, way back machine. Bookmark the permalink.